I just have to share this because it’s so stunning. You want to improve education in rural India. A good start is to impr ove attendance. So you look at the causes of non-attendance: poor transport to/from school; children having no uniforms; parents having poor incentive / not seeing the incentive to send their children to school; children being ill because of intestinal worms. You design programmes to solve each problem. Any of these sounds like a good idea. You could persuade a donor to fund any of them. Well, crickey, it turns out that the differences in performance are just vast. The charming-sounding de-worming programme is fully 25 times cheaper than making payments to families if their children show up to school: a 96% discount. That is, for every child you reach through a ‘conditional cash transfer’ programme, fully 24 needlessly miss out. Here’s the really amazing thing. If you de-worm children School A in the village, you get better attendance not only there, but also in School B down the road – where you did precisely nothing. Magic? 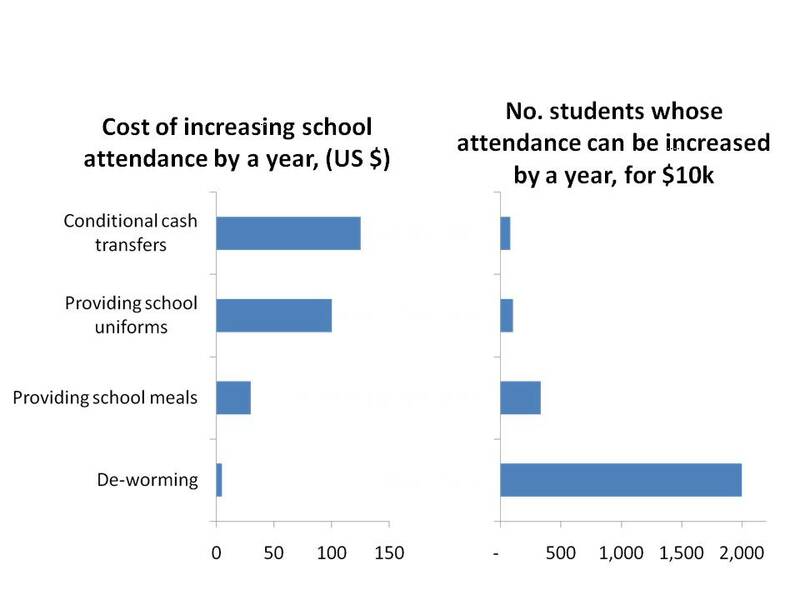 Well, it’s because worms are infectious and children play in close proximity – so de-worming School A reduces the chance of a child in School B getting worms, so their attendance improves too. Obviously the data here are striking in themselves. But what’s also remarkable is how rarely we see comparative data like these. Without them, for all we know, we’re routinely funding the uber-expensive, uber-wasteful programmes. If we’re to make most difference with our charitable giving, we need to get these data. We need to fund charities to get them, or – better – fund somebody independent to get them. This entry was posted in Great charities, Impact & evaluation and tagged charity, donation, donor, education, effective giving, giving, impact, impact assessment, randomised control trial, randomized control trial. Bookmark the permalink. 23 Responses to Buy one, get 24 free! What a fascinating statistic… as you say, this is the sort of information that we need to help us select where to make charitable donations, but we also need to know that the money we give is actually used for the programme we want to support.